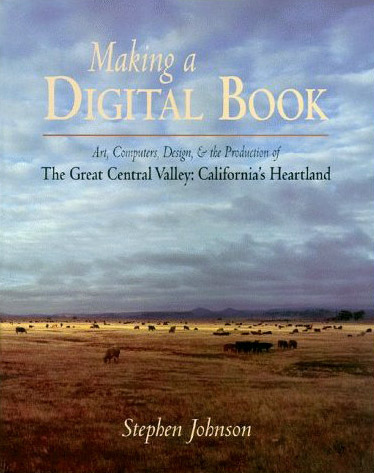 The Great Central Valley: California's Heartland, by Stephen Johnson, Gerald Haslam, and Robert Dawson, is much more than just another technology demonstration--it's an archive of a fast-vanishing piece of California's history, and a stunning example of the photographer's art. In Making of a Digital Book, Stephen Johnson documents the use of today's digital publishing technology in the service of art. His passion for the technology is second only to his passion for the work itself. This isn't a how-to book. Rather, it's a fascinating first-person account of a new artistic process, told from the perspective of the artist. Copyright ©1995, Stephen Johnson. All Rights Reserved.